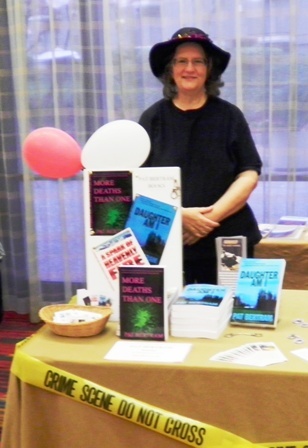 I went to Sacramento for a couple of days to set up my books at a special-ed teacher’s conference. When I opened my suitcase to unpack, I found a little surprise — a note from the TSA telling me they had searched my checked bag. (They also had searched my carry-on bag. Apparently, books are so dense, they show up as fog on the screen.) This was the first time I’d checked a bag — I prefer to travel light, but the suitcase was mostly filled with books, and I knew I’d never be able to lift it up to fit in the overhead bin — so I didn’t know what to expect. Luckily, I didn’t lock the bag. So, no harm done. We had Chinese food while I was there, and since my friend doesn’t eat sweets, I ended up with both fortune cookies. The first one I opened said, “The current year will bring you much happiness.” That pleased me until it occurred to me that perhaps that particular fortune was meant for my friend. So I opened the second cookie. It said, “The current year will bring you much happiness.” Apparently, this is going to be a good year! I sold a few books in Sacramento, which was nice. Visited with the friend who had invited me to share her table, which was nicer. Already my fortune is coming true! Lunar year or solar year? Wait, who cares? I know those fortunes are going to come true, Pat. No matter what happens to you, I’m sure it’ll work out for you.